I love camping, I always have. As a very small child I used to make tents from old sheets and broom handles and when an older cousin gave me his old 'pup' tent I was in seventh heaven. Camping with the Guides soon followed, my parents were slightly hurt that I never wanted to come home at the end of the week! I wanted to camp in the snow back in December but I chickened out! This early heatwave could mean only one thing – its camping time! I usually try to avoid campsites during school holidays but there was a little gap between Easter and the next Bank Holiday that was just calling out to me! It has to be said that Dennis does not share this enthusiasm. At 6' 3" he doesn't fit into tents awfully well. I think my Hilleberg Nallo is palatial, he thinks its coffin sized! However he does enjoy travelling and I managed to persuade him that one night's camping couldn't possibly be too bad! 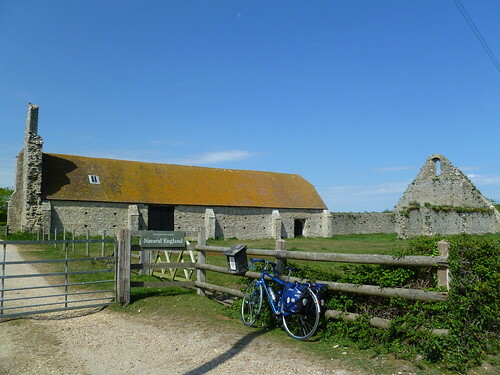 A further complication is that we have no car at the moment (its waiting for a new part so that it will hopefully pass its MOT) so we needed to find a campsite that is accessible by public transport so that he could meet me there. 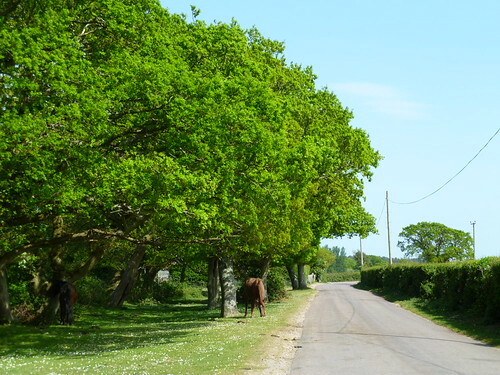 I was keen to go back to the New Forest (with no roughstuff this time) but the campsites I'd normally choose are in the middle of nowhere. A trawl of the internet came up with Ashurst which is rather closer to a busy road than I would have liked but only a couple of minutes walk from the station. 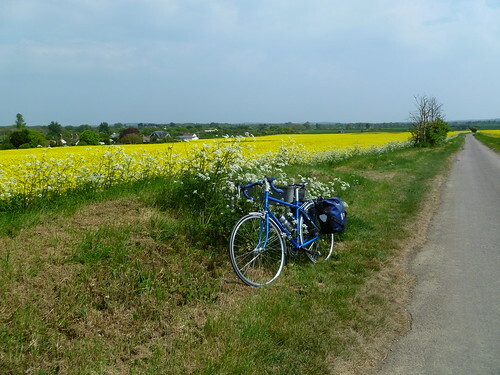 Dennis was carrying his sleeping bag, thermarest and clothes and I had the rest in my panniers which weighed 4.5 kg each. It was pleasant riding to Yarmouth with no ferry deadline to meet and I couldn't resist taking a couple of pictures on the way. I arrived in ample time for the 12.10 ferry. Dennis however was still in Newport bus station. Bikes are so much better than buses! 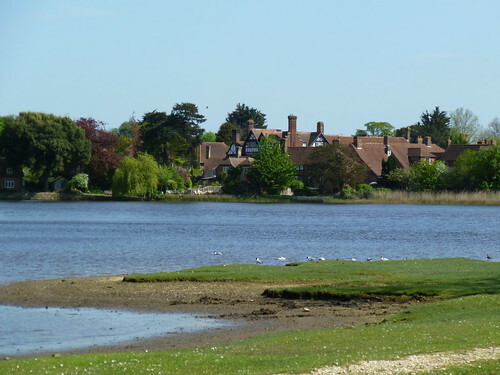 He arrived eventually and off we sailed to Lymington where he would take the train and I would ride some of my favourite New Forest roads to Beaulieu. This part of the Forest is very quiet with pleasant wooded lanes and very little traffic until the tourist honeypot of Beaulieu. 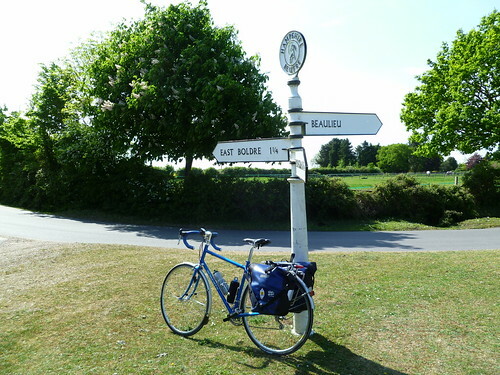 Even the signposts are pretty! 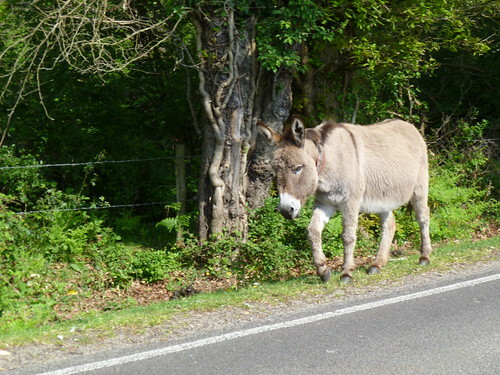 The roads became much busier around Beaulieu but I soon turned off to the left and then it was just me and the local residents again! 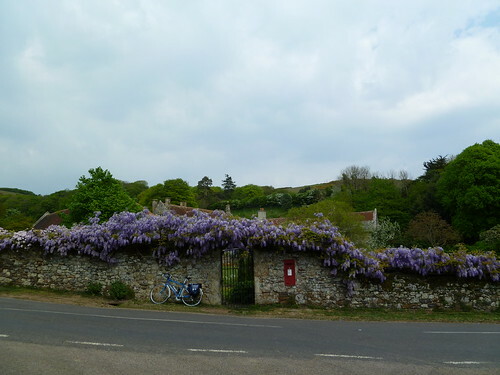 Pleasant roads continued until I was forced to join the very busy A35 just before Ashurst. The pavements on both sides are designated as cycle tracks but they weren't too pleasant to cycle on. I tried both road and pavement, the road was much easier and faster to cycle on but the pavement did offer some protection from the speeding lorries. Fortunately I only had a mile or so of this before reaching the turn off for the campsite where Dennis was waiting. The campsite was massive but largely empty. Ideal! 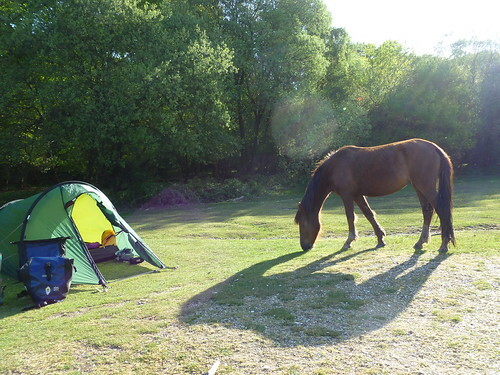 The lady in reception warned us that the ponies were likely to steal food out of our tent. I couldn't believe that they were sufficiently desperate to want to eat beanfeast! While we were looking for a good spot to pitch, a tiny grey pony looking as if he'd come straight from a Thelwell cartoon, walked straight in through someone's tent door leaving the bemused occupant frantically trying to get him out again. It wasn't long before we too got a visitor! It was a beautiful sunny evening. Nuthatches called continuously from the trees, quite a treat as we don't get them on the Isle of Wight. As we went for a stroll two Roe Deer ran across our path and a cuckoo called continuously. As the sun set the temperature dropped like a stone and we retreated to our sleeping bags. By the middle of the night it was absolutely freezing! I put my tracksuit bottoms and socks back on which helped and pulled the cord tight on my sleeping bag hood so that there was just a tiny space for my nose to poke out and breathe. I hadn't expected it to be so cold, I'd have brought my winter sleeping bag if I had! I'd almost persuaded Dennis that camping was fun but this was undoing all those good impressions! A tawny owl called, mockingly. Those first rays of morning sun felt wonderful while tucked up in my sleeping bag with a mug of tea. Strangely though I couldn't persuade Dennis that he wanted to stay another night and so we packed up and returned the same way we came. A good time was had by all! Kit List, if anyone's interested. Tent, Hilleberg Nallo. Fine for 2, palatial for one and quite light. I love it! Sleeping Bag, Mountain Equipment Dewline. This was the lightest available in 1995. If I had the cash or was seriously going touring I would replace it with a PHD Minimus. Mat, Thermarest Neo Air. Packs very small, very light but you need a lot of puff to blow it up! I originally had the 3/4 version but just couldn't get comfortable on it so sold it last year and bought the full length version. Very comfortable on hard stony ground. Pillow, Ajungilak Airpillow. Only air pillow I've used that could be considered comfortable! Light and compact and the yellow fleecy cover makes it look very cosy. Stove, Primus ETA Express. Fast boiling and fuel efficient. Also 2 small Trangia pans, large nalgene mug, plastic spork. Spare clothes, tracksuit bottoms, Icebreaker L/S top, windproof jacket, lightweight Montane waterproof jacket – unused. Food, Beanfeast and couscous. I'm going off this! Tiny toiletries and very small travellers towel. Usual bike tools, 2 spare tubes. Ortlieb Back Roller rear panniers. Posted by Hilary on April 29th, 2011. Hilary wrote: Dennis does not share this enthusiasm. I'm with Dennis on this. I've camped most years since I was a Boy Scout (that is a lot of camping) but in 2005 I swore I would never camp again – noisy British, cold evenings and too much crouching. I've become less tolerant you see, and I need a building! However, Mrs Taylor still loves camping so I make an exception when we've cycle toured abroad. In May we'll be camping in Holland. 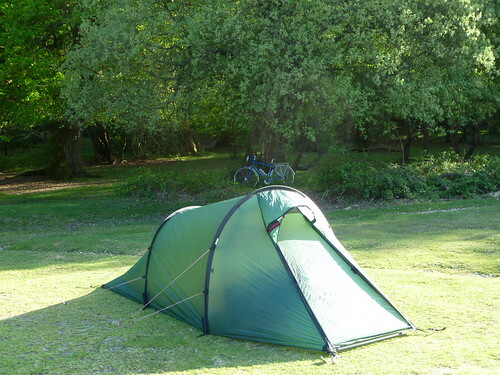 Our tent is a Hilleberg Nallo 2 GT, similar to yours but with a bigger awning for the eight panniers. Hilleberg make very fine tents indeed. How the people camping on the Mall last night got any sleep is anyone's guess. I can't get to sleep when it's noisy. 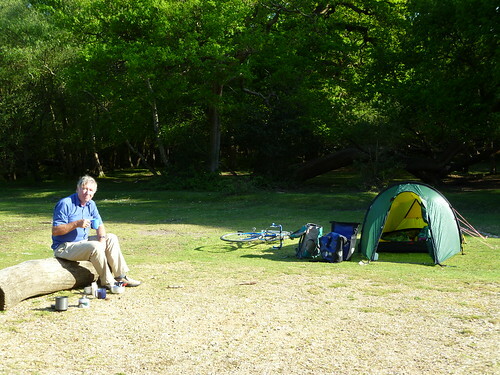 Having said that, your New Forest campsite looks very nice Hilary. No other tents – perfect. That trip looks like a lot of fun Hilary. Love the pictures as usual, so sharp and with good contrast. I must admit, I sort of fancy the idea of camping, until I consider rain, then I go off the idea. I hate being cold, and I hate being cold and damp or wet. Amazed how light you managed to pack your gear into. My other half loves his camping. He goes Bivie camping. No tent. (Madness!) Patrick, how did they get their tent pegs into the ground in london? Mary wrote: how did they get their tent pegs into the ground in london? Good question Mary. The ones I noticed along the Mall were small single-layer pop-up tents you can buy for £15 in supermarkets. They are like beach tents, with bendy poles that create a rigid dome without pegs or guyropes. As long as it's not too windy or wet, they are okay for a short period. At Glastonbury a lot are left behind afterwards because they are not worth carrying home. I plan on bivvying to and from Yorkshire. I use a Goretex bivvy bag with a single hoop. Quite palatial, as these things go. A girlfriend wanted to sleep in it, until she saw it erected in the garden. She shrieked, "It's like a coffin!" and never went near it. Alan wrote: ... Goretex bivvy bag ... Quite palatial, as these things go. I've rationalised the concept 'tent' into 'sleeping capsule' – that way, I might get to sleep! But it means it's just for sleeping and nothing else. palatial as these things go. I've got my eye on a rather more basic model from Alpkit but I'd definitely be on my own with that. There's no way I could talk Dennis into bivvying – he finds a sleeping bag too confining! There is an answer to noise. Boots Muffles Wax earplugs. These make you about 95% deaf for the night. You mould them in your hand and body-heat softens them. Push them into your ears. Flatten the outside with your thumb to form a seal. Pick 'em out in the morning. I use them if there are grandchildren staying, cycle touring and so on. And you can re-use them a good bit if you're not fussy.